Copy of a painting of Prince Rupert used for a Hudson’s Bay Company calendar based on an original produced by Sir Peter Lely in the 17th century. See more calendar paintings - enter 'calendar' in the search box to your left. They named a ship after him, also called the Prince Rupert. Check the Beaver Index - e.g., Rupert of the Rhine, by R.O. MacFarlane, June 1945. 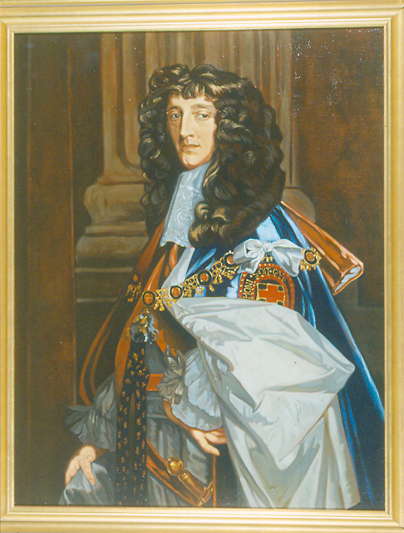 Prince Rupert was the first cousin of Charles II, King of England. He was the first Governor of what came to be known as the Hudson’s Bay Company. Rupert was a brilliant cavalry commander and admiral, an artist, a chemist, and a patron of the arts and sciences. He also had commercial investments in the Carolinas and Africa. Prince Rupert, along with other investors, and with the approval of Charles II, sponsored French fur traders Pierre-Esprit Radisson and Médard Chouart, Sieur des Groseilliers on a trading expedition to northern Canada by way of Hudson Bay. The success of this venture (1668) led to the creation of “The Company of Adventurers of England Tradeing into Hudson’s Bay” and the granting of a trading monopoly over all lands whose rivers drained into Hudson Bay. This region became known as Rupert’s Land and consisted of over forty percent of present-day Canada. Prince Rupert served in his capacity as governor from 1670 to 1682.